Carpets can, on average, gather up to 40 pounds of dirt in just one year. With kids running around, this average could be higher. Although carpets look nice and feel smooth under our feet, keeping a carpet clean is no easy task. A task made even more difficult for those of us with kids whose idea of ‘clean’ is just a little bit different from our own. Today we’ll be going through some tips you can use in your home, alongside with your children, in order to keep your carpets looking spotless. Vacuuming is your first defense when it comes to keeping your carpet clean. It helps get rid of any accumulated dirt and grime that is sitting on top of the fibers. Vacuuming away this dirt leaves your carpet looking fresh again. Try to vacuum daily or at least every other day to ensure the best results. Another option is to buy one of those cute little vacuum robots. The ones that constantly go around and vacuum for you. The robot vacuum could help keep your carpet clean and your kids may enjoy seeing it move around as well. A win-win situation! It’s good to note that vacuuming isn’t perfect at getting rid of built-up dirt. It helps keep the dirt from sinking into the fibers of the carpet, but eventually, that grime will get through to the deeper parts of your carpet. This is why you’ll want to resort to other types of cleaning on a semi-regular basis. Whenever something spills onto your carpet, react right away in cleaning it up. If left alone, those spills could easily become stains. These kinds of irremovable marks can make even the cleanest carpet look less than pristine. When cleaning up a stain, remember to dab away at stains and spills, don’t rub. Rubbing with a cloth will only help the stain to soak into the carpet fibers even more. Stains are one of the main reasons people turn to professional carpet cleaning for help. One of the best ways to ensure that your carpet is the cleanest it can be is by hiring a professional carpet cleaning company. It is often suggested that you have this done at least once a year to make sure you combat against any stains or grime that have begun to settle into your carpet. With kids around, it is possible that you may want to invest in a professional cleaning more often. It all depends on your family’s needs. These professional services have machines and techniques that are able to get an incredibly deep cleaning that isn’t possible otherwise. With their help, your carpets will look brand new and will remain durable for a long time to come. Sometimes playtime can get messy. When it comes time for your kids to let their creative spirit free, make sure you’ve got something covering your carpet just in case an accident happens. An old blanket works wonders in keeping any messy paints or markers from finding their way onto your beautiful carpet. Large beach towels or even a specific kind of mat could work as well. It doesn’t matter what you use as long as it has some thickness to it. A sheet, for example, would potentially be too thin to soak up any accidents and wouldn’t help your carpet remain stain-free at all. You’ll also want to find something that lets your kids have plenty of room to move around. Otherwise, they may find their fun outside of the designated area. And that wouldn’t do your carpet any favors. A great way to expand the life of your carpet, as well as to keep that carpet clean, is to no longer wear shoes inside the house. Instead, use socks or specific indoor shoes. Slippers are also a comfy choice. A lot of grime and dirt is tracked into the house and onto your carpet by way of shoes. It might not look like much at first, but over time, that dirt accumulates and sinks its way into the fibers of the carpet. Eventually, it will be that much harder to clean. A new fad that is starting to gain some popularity is tiled carpet. This kind of carpeting is tiled in much the same way as the tiles in your kitchen or bathroom. Small sections of carpet that you can have installed in any kind of pattern or style you can imagine. The genius about them is that, if a stain does occur, replacing that specific tile is significantly easier and cheaper than needing to replace an entire room full of carpet. They’re stylish too, which is why they are beginning to be seen in homes more and more. If you find that you’re having trouble keeping your carpet clean, perhaps this is a good choice for you and your family. Kids may not be as concerned with cleanliness as you are, but that doesn’t mean they can’t help out from time to time. While you are working on one section of the carpet, let the little ones work on another section. There are tiny hand-held vacuums that are the perfect size for small hands, and it could be fun to get the whole family involved in the upkeep of your shared home. Plus, if they learn early enough that a clean carpet takes work, they may grow to be more careful when it comes to making messes. If you implement some of these ideas into your everyday life, your carpets will continue to look beautiful and soft for a long time. Perhaps you can even get your kids to help out. 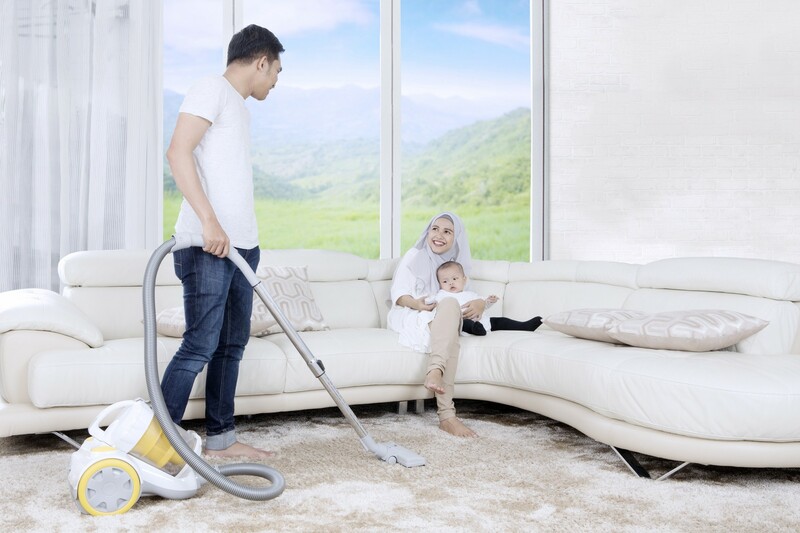 As a family, you’ll become pro-active towards keeping the carpet clean. Everyone will be happier for it. Need help scheduling a professional carpet cleaning? Contact us today!